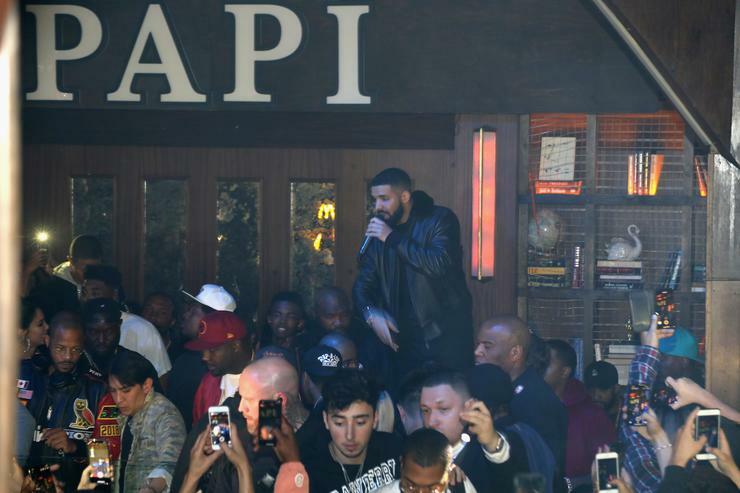 On Tuesday night, Drake threw himself a 2000’s themed birthday party at the Goya Studios in Los Angeles, equipped with a 7/11, Blockbuster Video and even cars from the classic MTV show Pimp My Ride. Many of his friends came to show love to the Toronto artist, including Diddy, Tory Lanez, Chris Brown, French Montana and more. Guests were asked to arrive in their best 2000’s attire to give the party a true feeling of being blast to the past. Drake himself dressed up as Fabolous, while French Montana sported baggy jeans and an over-sized jersey. He even had a Motorola Timeport inspired cake. Of course, staying with the theme, party goers danced to music from the 2000’s, especially when Drake himself became the mix master in the DJ booth at one point. He got some help at the booth from Swizz Beats and other musically inclined attendees.